In a new twist on speed cameras, the City of Laurel introduced two fake cameras this week. LAUREL, Md. – In a new twist on speed cameras, the City of Laurel introduced two fake cameras this week. In a story first reported by NBC 4, the two decoy boxes look just like the real cameras with police logos, except there is no actual camera inside. Laurel’s speed camera program has been in existence since December 2010. Currently, there are six real cameras within the city’s five mile radius. “I think they’re a great tool. You don’t know if it’s a decoy or there’s a camera in there, so hopefully it’ll get people to slow down,” says Laurel Mayor Craig Moe. McLaughlin tells WTOP he came up with the idea at the beginning of the year, pitched it to the mayor, then negotiated a price with their vendor over the last six weeks. The empty boxes cost about $2,500 apiece. “When I went to our vendor, Brekford, they laughed at me and said, is this really what you want to do?” says McLaughlin. He says the cameras themselves have a halo effect. For example, most Marylanders are unaware that speed cameras can only ticket drivers from 6 a.m. to 8 p.m., Monday through Friday. Drivers will often slow down in front of cameras on the weekend, unaware that cameras cannot issue tickets. McLaughlin says the decoy boxes will have a similar effect. “Is it trickery? Sure, you can qualify it however you want to qualify it. But if you don’t speed, you don’t have anything to worry about. Be in compliance,” he says. So will Laurel purchase more decoy cameras? McLaughlin said he will wait to see before making that decision. But he did say that police will rotate the decoy cameras with the real cameras every few months so that drivers will not know which are real and which are fake. Laurel resident James Gipson says it’s a good idea. But Mark Spitzer, who talked to us on Main Street in Laurel, disagrees with the decoy boxes. “I would be okay with a dummy car without an officer inside. I don’t like the dummy boxes. But I would be okay if you put in real cameras in busy spots like here where people speed a lot and pedestrians cross the street with drivers not stopping,” he says. Gwen Berry, who lives on Main Street, is worried the empty boxes will only lead to resentment. “Band-Aids like that will just backfire. People will throw them, break them or do what they want with them. They made a mistake by telling the public some of them are not real. They should talk less and do more,” she says. 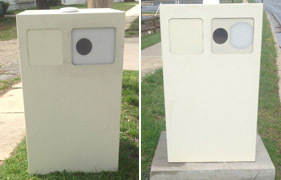 Meanwhile, WTOP has learned that New Carrollton Police are also exploring whether to purchase decoy boxes. Police Chief David Rice says he has had initial negotiations with vendor OptoTraffic about the price. He would also need approval from Mayor Andrew Hanko and the City Council. “We have noticed that drivers speed up after we move a camera out of a location, so deploying decoy boxes will stop this,” he says. If all goes well, Rice hopes to purchase and deploy two decoy boxes before next school year. WTOP has also learned that the City of Bowie operates a similar, although slightly different program than Laurel. The city has 14 speed camera boxes and eight speed cameras. Police Chief John Nesky tells WTOP their vendor physically removes the cameras from each box at the end of the day. Then, each morning, the police tell the vendor which locations to load the cameras into for the day. “The difference (in our program) is that all of our sites are in school zones and are capable of being active sites depending on the day of the rotation,” Nesky says. So while six speed camera boxes are empty, the exact locations of them change everyday. Other local jurisdictions tell WTOP they don’t have any plans to deploy fake boxes. In Prince George’s County, all 72 speed cameras are already mobile. They are also too large and would cost too much money to be made into decoy boxes. Follow Ari and WTOP on Twitter.